A polychrome enamel Gu shaped vase of square section. The base is flat and forms a flared stem that leads up towards a bulbous middle section. A sloping ridge divides this area with the stem and the flaring neck of the vase, which follows. Protruding flanges ornament the edges of the vase along all three sections. The middle section of the vase is painted with four shaped cartouches, each depicting a European-style village with buildings and a bridge in a romantic landscape setting with mountains and trees. The neck and stem are decorated with a design of stylised prunus flower heads on a ‘cracked-ice’ ground and with bands of stiff leaves. The interior is painted in a pale monochrome blue and the base is painted in white. The protruding flanges, the edges of the rims and base are gilded. This small, delicately painted fang gu vase represents an interesting combination of form and design. The fang gu shape is inspired by archaic Chinese bronze ritual vessels, which originated in the Shang dynasty (c.1500 – 1028 BC), an example of which can be found in the National Palace Museum, Taipei. The inclusion of Chinese designs, such as the prunus, ‘cracked-ice’ ground and plantain leaves, coupled with European landscape scenes makes this vase extremely rare. 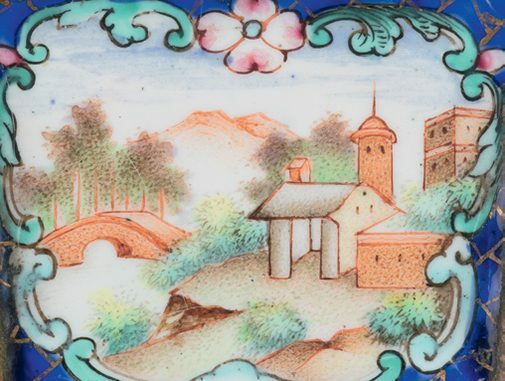 Jesuit missionaries who arrived in China from France are thought to have been involved in the production of painted enamels in the early part of 18th century, which helps to explain the blend of decoration. In the Chinese vocabulary of decorative devices, the occurrence of flowers on a ‘cracked-ice’ ground signifies the beginning of Spring, and therefore the beginning of new life. 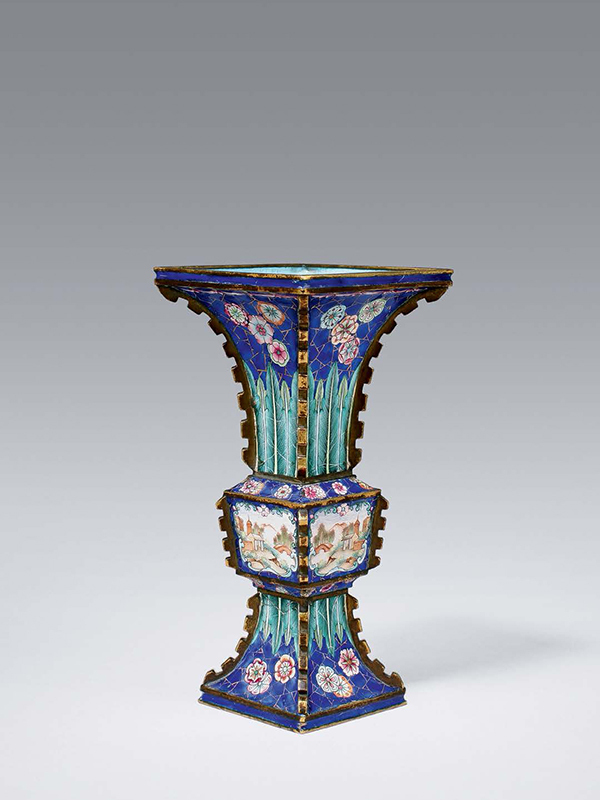 The Qianlong period witnessed an increase in the production of painted enamels for both internal and external markets. A pair of Qing dynasty painted enamel fang gu vases, similarly decorated with ocean blue enameling on the base, green leaf decoration and prunus flower on a ‘cracked-ice’ ground, is in the collection of the Palace Museum, Beijing (fig. 1). This pair of fang gu vases is part of a set of Wu Gong (five vessels for ceremonial offering), together with a painted enamel ding and two candle stick holders. 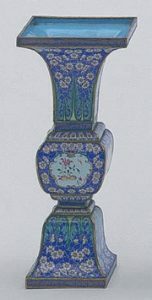 A larger painted enamel fang gu vase, comparable in the European figures decoration on each side of the middle sections, is dated to the Qianlong period and in the collection of the Palace Museum, Beijing.